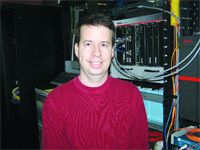 Matt Crocker says VoIP should yield a burst of growth for the family-owned company similar to the one generated by DSL. There has been only one major snowstorm in this mostly non-winter of 2006-07, but the mixture of snow, sleet, and freezing rain that visited the region on Valentine’s Day was messy enough to keep many people from making it into the office. Matt Crocker was one of them. But his decision not to test the elements resulted in little inconvenience for him or anyone trying to do business with him, because those who dialed his work number would have reached him at the desk in his home. “No one knew I wasn’t in the office,” said Crocker, president of Crocker Communications, explaining one of the many benefits of VoIP, or Voice over Internet Protocol technology, as it’s called. The service made possible by that technology has many names — IP telephony, Internet telephony, Broadband telephony, Broadband phone, and Voice over Broadband. They all describe essentially the same thing: the routing of voice conversations over the Internet or through any other IP-based network. In a nutshell, VoIP allows people to take their phone number (not just their phone) with them wherever they go. This adds up to a wide range of benefits for business owners, companies with multiple locations, traveling salesmen, snowbirds who can now have what amounts to a 413 phone number in Florida or Arizona, companies facing disaster recovery issues, and many other constituencies, said Crocker. He added that the technology also represents a huge business opportunity for this family-owned company, which last year celebrated its 50th year in business. It all started as Barrett’s Answering Service in Greenfield, a venture purchased by Crocker’s grandmother, Marie MacNeil, in 1963. “Back then, phone service was really localized; just making a call out of town was a laborious process,” said Crocker, noting that the company still provides answering services to hundreds of clients across the Pioneer Valley. But over the years, it has evolved into an Internet service provider (ISP), although Crocker’s mother (who took over the business in the ’70s) was at first hesitant, and needed convincing that computers were the wave of the future. Later, the company morphed into a competing local exchange carrier (CLEC), or phone company. This potent combination of voice and data services has enabled Crocker to enjoy steady growth over the past several years, and remain competitive in a field that has seen consolidation, price pressures, and declining margins. The addition of VoIP is the latest step in an evolutionary process that has been defined by commitment to using technology and customer service to most-effectively meet client needs, said Crocker. The company has invested close to $1 million in an 18-month ramp-up and the flipping of what is called a VoIP soft switch. In layman’s terms, this is the technology that enabled Crocker’s clients to dial his work number and find him at home on that snow day. It’s also the technology that allows people to dial a vendor in New York and reach him while he’s on his a business trip to China, and allows a company hit by fire, flood, or other disaster to get back on its feet in a matter of minutes, not days or weeks. In this issue, BusinessWest examines VoIP and what it means for a company that got its start with rows of phones on a table, and is now helping people make and answer calls in ways that might not have been imagined in 1956. Crocker told BusinessWest he recently completed the purchase of a new home. As it is for everyone, this process proved to be exciting, but also frustrating and time-consuming. And it provided Crocker a perfect example of the ways in which VoIP can be used to improve customer service, among other things. “My Realtor was making a big commission off me, but here I was having to dial a bunch of numbers trying to find him; he made me go through hoops,” Crocker recalled, adding quickly that if this Realtor had been outfitted with something called ‘Find Me/Follow Me,’ one of the features of the hosted VoIP system Crocker is now marketing, he could have been found anywhere by pushing one button in speed dial. This, in simple terms, is what VoIP provides. The technology isn’t exactly new, but it is finding greater acceptance in business and in the home, because it can facilitate operations that may be more difficult to achieve using traditional networks. For example, incoming calls can be automatically routed to one’s VoIP phone, regardless of where they are connected to the network. Meanwhile, call center agents using VoIP phones can work from anywhere with a sufficiently fast, stable Internet connection. “Right now, your phone number is on your phone line, the physical wire that your phone company runs to you, and any phone you plug into that line inherits that number,” he explained. “With VoIP, the phone number is assigned to the phone, and anywhere that phone is the phone number will follow; it’s not the line that matters anymore, it’s the phone. The move to VoIP is the latest nod to emerging technology at Crocker, a company that has expanded and diversified with two goals in mind — serving client needs and adding revenue streams; VoIP accomplishes both. Diversification efforts started in the ’70s, when the company, seeing only minimal growth in the answering service business, morphed into a private dispatch center, summoning police, fire, and ambulances in the days before 911. It later expanded its answering service operations to all of Western Mass. through a facility in Northampton. From there, the Crocker family entered the Internet business in the mid-’90s, after Matt convinced his mother that hers was a communications business and that the Internet was the next wave of communications. And over the past decade, the company has been at the forefront of change within Internet service, specifically the shift from dial-up to DSL, or digital subscriber lines, starting in the late ’90s. It has done so through operations in Greenfield and a data center located in the Technology Park at Springfield Technical Community College. In 2000, the company launched Crocker Telecommunications and its CLEC operations. Ramping up the VoIP service has been a three-year process from conception to going live, said Crocker, one that has included several “curve balls” from the Federal Communications Commission regarding 911, wiretapping, and other security issues. The company cleared all those hurdles, and went online with VoIP earlier this year. The VoIP soft switch, the so-called ‘next generation switch,’ amounts to a carrier-grade software package that runs on a series of seven computers that can handle roughly a million phones and provides all the traditional phone features — including dial tone, voicemail, call forwarding, and call waiting — but does so over the Internet. A few customers have switched over from DSL — the process usually takes about a week, and is what Crocker described as “detailed, not complicated” — with many more expected to do so in the coming weeks and months. The business plan moving forward is to focus first on the company’s 1,100 or so DSL customers and 150 T-1 customers and convince them to convert, then quickly move on to adding new clients, said Crocker, adding that the target market is the 413 area code, specifically the Pioneer Valley and the I-91 corridor from Connecticut to Vermont. He believes that the product can almost sell itself — if people can come to understand the technology, all that it can do, and probable cost-savings. “VoIP is a technology that we use to provide hosted IP telephony — it’s what you do with that technology that makes the difference,” he said, noting that there are many providers currently providing cheap VoIP capability, but few features. These include Find Me/Follow Me, which enables users to route incoming calls, according to some pre-defined criteria, and to a specific destination. For example, the system can be programmed to reroute calls to one or several pre-configured telephone numbers, If the individual is not available at the first number, the system automatically tries the second number, and so on. If the system is unable to locate the individual ay any number, the call is transferred to voicemail. This feature would obviously improve customer service, said Crocker, while also enabling managers to reach employees and salespeople more easily. But VoIP has other, more practical benefits for business owners, managers, employees, and customers. One is the broad, and increasingly important, subject of disaster recovery. With VoIP, a company that might have been crippled by a fire or flood can recover more quickly because it doesn’t need a new phone system installed. There are also a number of benefits for companies with multiple locations, call centers, and business people who travel frequently. From a business standpoint, VoIP enables Crocker to layer more services for its customers, thus generating more revenue from each — a key consideration in a relatively no-growth market, and also at a time when many smaller ISPs are finding it more difficult to compete with the giants in the industry. As the calendar turns to March, Crocker has less concern about snow days, for this season at least. But the ability to work at home without any real convenience to clients is simply one of the many practical and economic benefits of VoIP, which is both the technology of the future (and today) and the voice of reason — literally.